Set the Show Structure, you can have as many Acts or Intervals as you like and in any order with any name! Simply tap what you need and set your interval durations. Simply tap the relevant buttons to store the appropriate time! Couldn't be easier. When you tap it the button it displays the time of the event. Pretty self explanatory, tap Act Down when you are ready to move on. 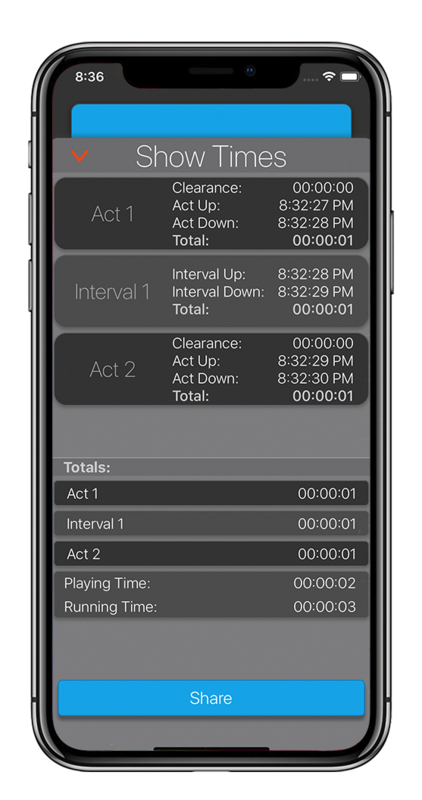 Start unlimited In-Act Timers, ever needed to time the length of a scene or feature, simply tap the "Start A Timer" button and away you go. You can also preview all times, Show Stops and Timers by tapping "Show Times", this will calculate running and playing up to the current act. If you ever go forward by mistake all Act and Interval screens have a reset and a back button which can take you to where you left off! Share your show times with a tap of a button, either email them to a group (all of the contacts can be added in settings) or copy them to the clipboard to paste them anywhere you like! Nobody ever wants to show stop, but if you do you'll be glad your running Show StopWatch! Simply press the ShowStop button in the top left, then we'll give you the time that you stopped and the time elapsed! Hit resume when you are ready to continue and well calculate everything else! Here you can see the time remaining, and the elapsed time of the interval. Once the time remaining of the has reached zero, it'll go red and start counting up. You can also get interval notifications, these will notify you "x" minutes before the five and beginners calls. The time that the call happens and the amount of time before the call that you receive a notification are all configurable in settings. Interval safe mode is a way of letting your phone stay unlocked with the display active without the worry of progressing to the next act! We've found it great if you have interval cues, want to keep Show StopWatch open, but don’t want to worry about where you hold your phone! When you are ready to move on, just enable the buttons and away you go! Let us take all the hassle of calculate show times, we automatically calculate the running and playing times and all running times of Acts and Intervals, it doesn't matter how many well add them up! You can round all the times within Show StopWatch, in settings you just select how accurate you need them to be. If you Show Stop, we take the duration of the show stop off of the total playing time, but not the running time. Sharing times couldn’t be easier, you can share your show times via message, email or copy them to your clipboard and paste them anywhere you like. You can also choose to include “In Act Timers” when sharing as well.